On February 7, HDFC Bank increased MCLR by 10 basis points for some tenures, while Axis Bank in January 2018 had raised the benchmark by 5 basis points. RBI has maintained a status quo in its monetary policy, but several banks have decided to increase their MCLR, indicating that your EMIs on personal, home or car loans may rise up. 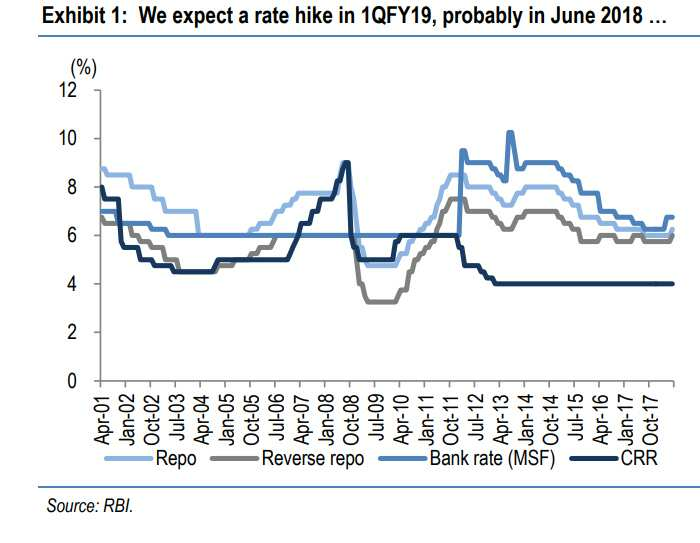 The central bank kept policy repo rate unchanged at 6% since past three policy announcements, but bankers especially private lender have one-by-one started to increase their Marginal Cost of Funds Based Lending Rate (MCLR), with HDFC Bank being the latest one. MCLR hike was first signalled, when SBI started raising bulk deposit rates, under which rate of one-year deposits jumped by 200 basis points of over Rs 1 crore. It may be noted that the largest lender SBI and other PSBs are yet to raise MCLR rate, but analysts have already predicted a rate hike. Since MCLR is more sensitive to rate signals, RBI during the last policy of FY18 announcement decided to harmonize the methodology of determining benchmark rates by linking the Base Rate to the MCLR with effect from April 1, 2018. Not only this, RBI has also been directing banks to reduce the weighted average lending rate (WALR) in order to improve monetary policy transmission. 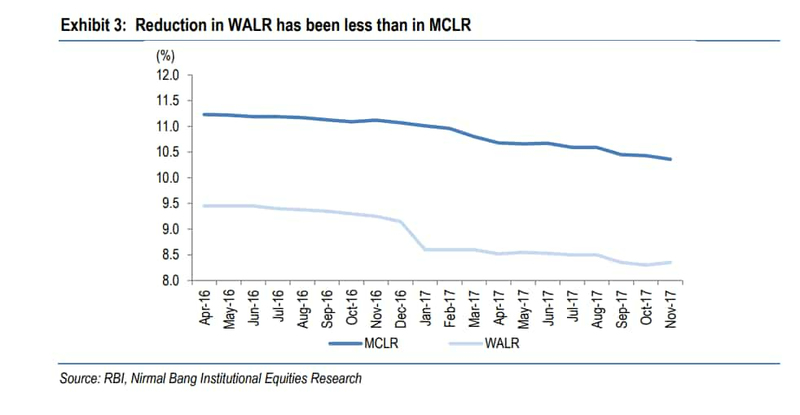 In past one-year, MCLR declined over 90 basis points, but the decline in WALR was just 76 basis points with much of the reduction being back-ended. Also an RBI study revealed that every 100 basis point increase in borrowing cost lowers the investment rate by nearly 91 basis points. Thus, the internal study group appointed by RBI laid out a list of factors that can be used for better lending rate mechanism. As per the study group, there is a need to move to one of the three external benchmarks, viz, the treasury bill rate, the certificate of deposit (CD) rate and the RBI’s policy repo rate, which is outside the control of an individual bank from April 1, 2018. While decision on the spread over the external benchmark should be left entirely to the commercial judgment of banks, with the spread remaining fixed all through the term of the loan unless there is a contractually pre-defined credit event. Periodicity of resetting the interest rates by banks on all floating rate loans, retail as well as corporate, be reduced from once in a year to once in a quarter to expedite the pass-through from the monetary policy signals to actual lending rates. It is also being recommended that banks should migrate all existing loans linked to the BPLR/base rate to the MCLR if the borrowers choose to do so without any conversion fee or any other charges for switchover and on mutually agreed terms. However, as adoption of external benchmark is seen starting from April 1, 2018, banks are advised to migrate all existing BPLR/base rate/MCLR borrowers to the new benchmark without any conversion fee on mutually agreed terms between borrowers and lenders by end-March 2019. Finally, banks are also advised to accept deposits, especially bulk deposits at floating rates linked directly to one of the recommended external benchmarks. But, it was not seen as welcoming move from bankers. RBI carried a survey asking for feedbacks on the above mentioned recommendations. The Indian Bank Association and banks in general have expressed that the MCLR system is working well and that it should continue. Together, they presented a case that loans of most Indian banks are funded primarily by retail deposits and not from the wholesale market as is the practice abroad. Hence, they added that if interest rates on deposits remain sticky, banks cannot lend at rates linked to an external benchmark which may change every day, unless they manage this interest rate risk well. On reset period, which RBI decided to fix on quarterly basis, the banks have opined the move. At present, by matching the reset period to the tenor of the MCLR (like one year MCLR linked loans having one year reset period), banks address the interest rate risk in the banking book. Even if an external benchmark is launched, the banks ask that the reset period should be linked to the tenor of the underlying external benchmark. According to them, while longer reset periods increase transmission lags, shorter resets increase interest rate risk for banks. “Few banks - both in the private and public sector - have increased bulk deposit rates, while private sector banks have led the way in raising MCLR. However, some banks continue to reduce bulk deposit rates,” Teresa John added. If we take into consideration the views of experts, EMIs on any form of loan would see an increase in future ahead. EMIs are fixed amount of money that borrowers need to pay on monthly basis to lenders or financial institutions, towards the loan amount they have taken. EMIs involve principal amount and interest rate of the loan, and if banks choose to increase MCLR ahead, which is the benchmark of deciding lending rate, then you will end up paying higher EMIs on loan amount. Banks have indicated that retail customers would resist a shorter (quarterly) reset, particularly in a rising interest rate cycle, because of the increase in equated monthly instalments (EMIs) or longer repayment period with uniform EMIs.